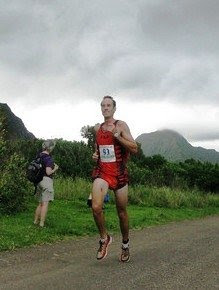 Jim Davis was 5th at the world championships for trail runners in the time of 1:31.51. Davis is the head coach of Mid-Pacific Institute's high school T&F team, in Honolulu. Not that it every snows (see pics above) in Williamsburg, but the Hawthornes try to get everyone in the mood with their annual party. 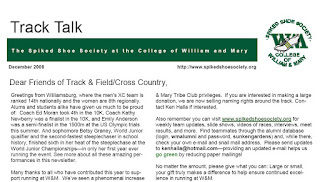 You should have or will soon receive your semi-annual newsletter in the mail or you can see it here. Fraser Hudgins, Brigid Dorsey, Michael Keeling, Rick Platt and Randy Hawthorne spent a lot of time putting it together. We need others to help us. If you'd like to help in the future, please e-mail kenhalla@hotmail.com. According to this, there are only 17 teams that have gone to the NCAA XC meet more than the men's team twenty-two appearances. The national leader is Wisconsin with forty-seven trips to the meet. The top finish remains the 1973 team that was 4th. The women have gone six times to the NCAA XC meet. 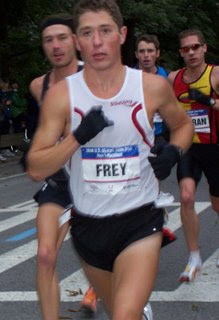 Jacob Frey '04 was 15th at this fall's New York City Marathon in 2:20.15. After suffering a major ankel sprain this summer, Adam (pictured above on the left) had 11 weeks to ready himself for one of the most grueling physical challenges. 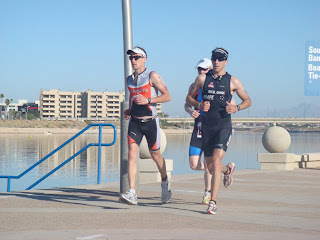 He ended up finishing Ironman Arizona in a time of 9hours 12minutes and 45seconds. A new PR and a time good enough for 2nd in his age group (25-29yrs old), 31st overall, and the 6th amateur. By virtue of his age group position, he has qualified (for the second time) and accepted (for the first time) a chance to race next Fall in the Ironman World Championships in Kona, Hawaii. He was unable to go this past time, because he had already decided to race the World Duathlon Championships (of which he won his age group - in other words he is a world champion). His splits were: 53:31 for the 2.4 mile swim, 4:59:55 for the 112 mile bike, and 3:11:29 for the 26.2 mile run. Thanks to Tim O'Dowd '80 for these pictures with the throw back uniform. Click here or on the picture to see them all. Moran ran a 13:47 first leg handing off the sash in 5th place. The team then fell to 8th overall. If you look closely at the video, you will see Moran running his leg. The men performed about as the polls predicted finishing one place lower than in 2007 with their sixteenth place finish. Unlike last year there was no front runner so the team's success came about due to the thirty-six second spread between the first and fifth runners. Leading the team was Patterson Wilhelm who was 69th in 30:38, followed by Jon Grey in 78th (30:43) and Colin Leak (30:52) in 95th. Rounding out the top five were Ben Massam in 124th (31:04) and Lewis Woodard (31:14). Tom Burke and Peter Dorrell were 195 and 241st respectively. Daniel Nally '07 and Adam Tenerowicz '08 ran 2:27:54 for 7th and 2:32:02 for 19th places respectively at the Philadelphia Marathon yesterday. Gibby talks about the season to date and the NCAA meet. After the great race at Regionals, the men are now ranked 14th in the US. 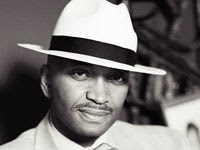 More (picture from Flat Hat). Also remember the women's team and the men's "B" team are competing this weekend at the ECAC/IC4A meets. If you want to see the XC meet live (men at 12:48) go here on Monday. Flotrack will be there with interviews (and has a nice video of the actual course here) as will Trackshark. Here is the meet website. If you are going to the meet, it includes a course map, how to get to the meet and more. On Monday, click here for results. The NCAA field was just announced and unfortunately it does not include any W&M women. The men, of course, are automactic qualifiers. Check back later in the week for ways to watch the even live and get results quickly. Yes, the men should easily qualify, but you still have to run the race. Will they get to a 12th straight NCAA meet and will Emily Anderson join them for the women? Click here on race day for all the results. You can also go here to see a preview of the meet. Click here to see some video from both the men's and women's races as well as a short interview with Emily Anderson. As is common with Gibby led teams, the men have now started their late season climb up the national polls. They are still ranked #2 behind Virginia in the Southeast region where the first two teams will automatically qualify for nationals. The women are ranked eighth in the region. 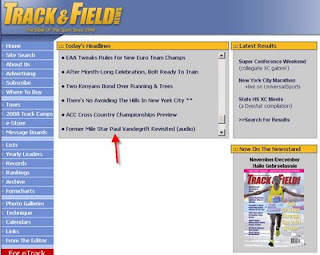 Last year runnersworld.com linked to one of our interviews and today trackandfieldnews.com did the same (see above) for the interview with Paul Vandegrigt below. 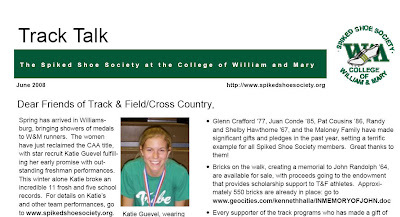 The last time a W&M person was featured in T&F News for adding a story was when our own Randy Hawthorne was a regular contributor in the 1980s! This is a great spectator course as you can see the runners about eight times without breaking into a sweat. Unfortunately I got to the meet too late to record the women's race (my daughter had a skating lesson! ), but above you can hear Emily talk about her race. 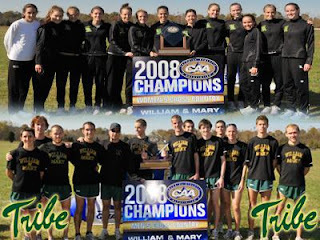 The William and Mary Tribe women’s cross country team continued its dominance at the CAA championships on Saturday, winning its sixth-straight conference title. Junior Emily Anderson was the individual winner in a time 21:02, fifteen seconds better than the rest of the field. Meghan Burns finished in third place with her time of 21:18, while Betsy Graney came in sixth with a time of 21:43. Junior Kayley Byrne finished eighth in a time of 21:49, with teammates Lynn Morelli and Heather Beichner right behind her in ninth and 10th, respectively. More , more and more. 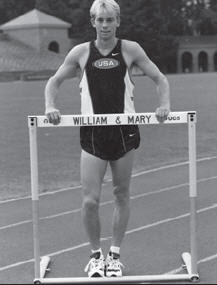 Vandegrift '92 was the top rated miler in the US coming out of high school and continued on that trajectory earning seven All-American titles at W&M. After school he ran several summers in Europe and finished as high as 4th at the T.A.C. (now USATF) meet. Today he is a high school English teacher, track and cross country coach. 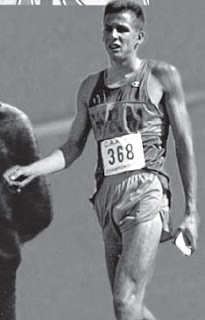 One of his first cross country/track athletes was none other than Ed Moran. Click here to hear the interview (give it a minute to load). The men's team ranking stayed exactly the same this week nationally and likewise they remain 2nd in the region. The men's and women's team will be at the CAA meet this weekend at 10 am in Manassas, VA.
USATF announced that Coach Moran is one of five receiving $4000 grants to help their running careers. 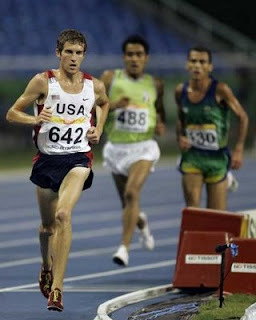 Moran was 4th at the Olympic Trials in the 10K this past summer and was a four time All-American runner at W&M before starting his coaching career. Alex Ball is becoming quite the movie maker. Watch the video of the race and analysis by Coach Fritz who both knows the pole vault and apparently cross country! 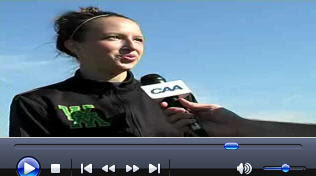 There is also an interview with tatoo laden Ariel Burbey as well as Meredith Tighe and Kelsey Budd. On the men's side we get interviews with Lewis Woodward and Dan Stimson. The men's team, despite having a sub par race from Massam, is now ranked 21st in the country and ranked 2nd in the region just behind UVA. So after losing Laundry and Fitzgerald to graduation and end of eligibility, the team now stands a very good chance of automatically qualifying for the NCAA meet (top 2 in region). The women's team is now seventh in the region. 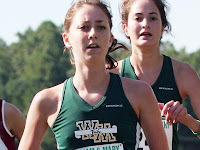 Tim O'Dowd '80 takes pictures for the Irish Runner and kindly put together a number of pictures of the W&M women here and the men here from the pre-nationals meet this past weekend. With no XC eligibility, Ian Fitzgerald won the race with Lewis Woodard, racing in a Tribe singlet for the first time in his career, finishing second in 25:17. Chris Tyson was third in 25:30, and Jay Bilsborrow finished fifth in 25:35. Robert Sagar led three teammates across the line with his ninth-place finish in 26:04, finishing ahead of Sean Sewell in 26:13. Meredith Tighe took home the individual title, crossing the line in 23:14. Ariel Burbey was second in 23:16. Sara Lasker finished third in 23:43, and Robin Vanneman took fifth in a sprint at the end over Amelia Emerson, 23:55 to 23:56. Avery Mattingly was seventh in 24:27, and - Kelsey Budd was in 15th with a time of 25:53. Click here for the men's and here for the women's results. The video is coming soon. The women had a great start coming through the halfway mark as the 4th team, but fell to 16th by the finish line. Here are team and individual results. At the 5K mark, the men were in 4th and finished in 6th place (individual results). Patterson Wilhelm was the top finisher crossing the line in 24:09.8 for 27th place. Close behind was Jon Grey 29th in 24:11.0. Colin Leak was 39th in 24:19.9, and Tom Burke (was 53rd in 24:28.8. Peter Dorrell rounded out the scoring for W&M in 94th (24:51.9), with Ben Massam 25:10.9, and Charlie Swartz 25:29.8, crossing sixth and seventh to serve as displacers. The top video is the men's highlights you can see the entire race by clicking here. All-American Emily Anderson was the top finisher in 21:19.4 for 45th place. Meghan Burns was second for the team, finishing 90th in 21:47.4, Kayley Byrne was 100th in 21:53.5. Lynn Morelli ran 22:03.1, Heather Beichner finished the scoring in 138th with a time of 22:11.2. Emily Arena and Emily Schroeder finished in 22:20.0 and 22:33.3. 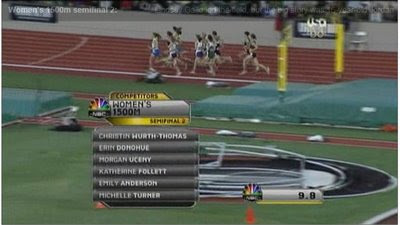 The bottom video is the highlight race for the women and here is the entire race. In the most recent rankings, the men's team remains at 24 and are ranked third in the Southeast Region. If nothing else changes, that would mean the men have a great chance to going to the NCAA meet. But all that will change after the pre-national meet tomorrow. Hopefully that will mean the women move up as they are now ranked 11th in the region which is no where close to getting to nationals. I will have results up soon after the meet, but the women are running at 11:35 am and the men at 12:10 pm. Also there video from the meet can be found here on race day. 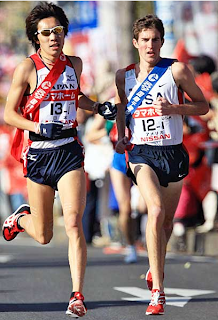 To see a preview of the men's race go here. After moving up to 22nd with the inter-regional meet, apparently not racing means a team may fall two places as the men have done this week. The women remain unranked. Arena has twice been in the top five for the Tribe. Here she talks about the season so far, how the team has 5-6 runners training in a pack and their hopes for the pre-National meet coming up. Coach Gibby (see interview from last week below) may not care about early season polls, but the men's team moved up one slot in the NCAA poll to 22. This rank puts the men behind UVA (12th) and NC State (13th) in the Southeast region. The women still are not in the top 30 while Southeast region rivals NC State (20th), Duke (26th) and North Carolina (28th) are in the ranking. You can see the Flat Hat article on the Inter-Regional meet by clicking here. Alex Ball just bought his video camera and is already at work with race coverage and interviews with both the men and women from the race earlier today. Running against former W&M coach Walt Drenth's Michigan State team, the men, who are ranked 23rd in the nation, won and while the women fell to the 8th ranked team in the country by a score of 19 to 42 with only All-American Emily Anderson breaking up their front five. Kayley Byrne finished in sixth-place with a time of 22:09.0, while Lynn Morelli came in seventh, Meghan Burns in 13th and Emily Arena finished in 14th. More The men had 3 in the top five with Ben Massam winning the race, followed by Colin Leak in second place with a time of 25:04.1 and Patterson Wilhelm came in fourth with a time of 25:09.5. Jon Grey finished in 13th followed by Tom Burke in 15th. More Come back in a few days for some interviews. Junior Alex Ball will be helping us this fall with interviews. Here is his first video where he ask about the upcoming season, the recent ranking, the loss of last year's # runner and more. So this movie is about nine people who tried to make the 2004 Olympic team including Lane who was 4th in the 5K (as he was in 2000). Click here for the trailer which is mostly Lane talking. After eleven straight trips to the NCAA meet, the men are ranked 3rd in the Southeast behind NC State and UVA and 23rd in the US. Check back in a few days for an interview with the coaches about the outlook for the season. Talk about a challenge. Arena ran the Imogene Pass Run which is a 17.1 mile point-to-point mountain race within the western San Juan mountains of Colorado, run along a route which connects the towns of Ouray (7810 ft.) and Telluride (8820 ft.) by way of 13,120 foot Imogene Pass. He finished 24th overall and first in his age group. 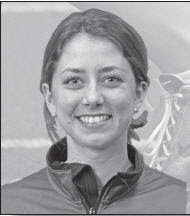 Brittany Sevachko: Three-time Nike Indoor Championships All-American Four-time All-State in indoor track and three-time All-State in outdoor track . Four-time All-District and four-time All-District in indoor track Three-time All-Region and three-time All-District in outdoor track NSIC Academic All-American in 2008 Honorable mention in the Washington Post for both indoor and outdoor track in 2008. Cam Shriver and Ian Fitzgerald (co-winners) for the men and Emily Anderson for the women. On June 4th, Burns, Lewis, Graney, Fitzgerald and Grevel will find out if they qualify at large for the NCAA meet. Miller '10 continues with his Regionals blog: Didn't really do too much Friday. Went over to the track at around 11:00 to run and do some strides. I would have liked to use the water pit a couple times, but weweren't allowed on the track. Felt pretty terrible running at first, but I think it was just the humidity, because I felt great doing strides and going over hurdles .Took a nap after we got back to the hotel, and then ate lunch and went back to the track to watch the prelims of the 1500. Walked around the area near the hotel trying to find somewhere to eat dinner; felt good to stretch out a little bit instead ofjust sitting in the room. Nicole Kazuba took fourth in the pole vault to earn one of the five automatic-qualifying spots in the event in 12’ 11.75” which is the second-best of her career. In the 800m Allie Lewis ran the fastest time in school history, 2:08.30 placing 11th in preliminaries and making her eligible to be selected on an at-large basis to the NCAA Championships. Emily Anderson ran 4:22.01 in preliminaries and Meghan Burns ran a career-fast 4:24.83 which ranks fourth in school history. Both will run in the finals today. More. Ian Fitzgerald ran 14:14.95 in the 5,000m race Friday night, finishing in eighth place in the 24-man field. By dint of finishing in the top 12, Fitzgerald is eligible to be selected as an at-large entry to the NCAA Championships. 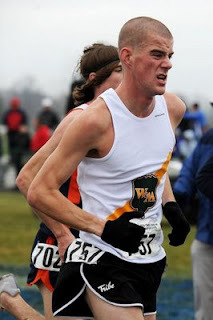 Patterson Wilhelm ran 14:35.00 for 15th place. In the high jump Cam Shriver missed on all three of his attempts at the first bar. More. Click here today for live updates. Got up at 4:45 to go to the airport. Had to sit in the middle seat on the way to Jacksonville, but the flight attendant gave me about a hundred bags of peanuts for moving so that some kids could sit with their mom. Drove from Jacksonville to Tallahassee. Gibby missed the the first exit where we were going to get lunch, but we still found a Subway. We got to the hotel around 1:00. Took a shower, and slept until a little after 5:00. Went out to the track at 5:30, ran around the Florida State campus with Rob, Fitz, and Pat, and did 4x200 on the track. Felt pretty stiff at first, but then actually felt better than I have in a while on the track, and definitely much better than I expected after traveling. I liked the track a lot, it felt fast. Coaches Gibby and Newberry are not only partners in life, but also do a tremendous job of working together coaching the distance squad. Listen to interviews as they provide insight regarding training, race strategies, and potential Tribe NCAA qualifiers that are sure to provide highlights at NCAA Regional Meet this weekend in Tallahassee, Florida. Click here for Gibby and here for Kathy.